Custom MMIC is a complete ISO-certified designer and supplier of standardized high performance MMICs for your military, aerospace, and space qualified applications. We have longstanding and flexible relationships with world-class MMIC foundries and offer the highest reliability and competitive pricing. Review solutions, download technical literature and s-parameter data, and request pricing at www.custommmic.com. Our amplifier MMIC products provide industry-leading gain flatness and stability, noise figure, phase noise and linearity, and also offer unique benefits such as positive gain slope, positive biasing, and 50 ohm matching. Models include low noise amplifiers (LNAs), driver amplifiers, power amplifiers, low phase noise amplifiers (LPNAs) and broad range distributed amplifiers. Our switching and frequency conversion MMICs offer state-of-the-art insertion/conversion loss, bandwidth, and isolation for advanced signal chain design. These products include SPST to SP4T Switches, RF Phase Shifters, and Voltage Variable Attenuators. Our gain and phase control products provide the highest accuracy, along with low loss. Our mixer models include fundamental mixers, dual mixers, and I/Q / I/R mixers. Our RF multiplier MMIC family includes both passive and active solutions. For RF / microwave designs that require complete space qualification, Custom MMIC offers full screening of our standard MMICs to MIL-PRF-38534 Class K & MIL-PRF-38535 Class S. Several low noise amplifiers (LNA) MMICs, and a driver amplifier MMIC, have been previously space qualified. MWJ Editors, Pat Hindle and Gary Lerude, talk with Custom MMIC president and CEO, Paul Blount about the company's history, evolution and markets. Part I of interview series. MWJ Editors, Pat Hindle and Gary Lerude, talk with Custom MMIC president and CEO, Paul Blount about what the company will be featuring at IMS 2018 and their future plans. Part II of this interview series. RF Globalnet and Custom MMIC's Christopher Gregoire, Senior Engineer discuss how to simplify the designs for wideband systems, and maximize SWaP-C in all applications with the use of positive gain slope amplifiers. Custom MMIC announced the company received a Gold Supplier rating from BAE Systems’ Electronic Systems sector in Nashua, New Hampshire. Custom MMIC announced the award of its inaugural “Women In Engineering” scholarships, which will help three young women pursue undergraduate degrees in engineering. Custom MMIC announced it has hired Thomas M. Rosa for the role of senior VP and CFO, effective immediately. Custom MMIC is excited to be exhibiting in a new booth at the 2018 International Microwave Symposium (IMS) in Philadelphia, Pa, June 12 through 14. They will be in Booth #851 and discussing exciting new GaN and GaAs MMIC technology breakthroughs. Custom MMIC received 5-star recognition from Raytheon at the Integrated Defense Systems (IDS) 2018 Supplier Excellence Conference in May. Custom MMIC is proud to announce the addition of sales representation in the Scandinavian region. Custom MMIC announces their attendance at European Microwave Week 2017 (EuMW) in Nuremberg, Germany, October 8 through 13. Custom MMIC is exhibiting at the International Microwave Symposium (IMS) 2017 in Honolulu, Hawaii in Booth #1355. Custom MMIC is proud to announce their recognition by Raytheon Company, one of 84 companies recognized by Raytheon’s Integrated Defense Systems business for 4-star honors. Custom MMIC announced a new technical brief illuminating their progress reaching incredible linearity with passive MMIC mixers using GaN technology. Custom MMIC, a leading developer of performance driven monolithic microwave integrated circuits (MMICs), has added new category to their rapidly expanding standard product offerings. Custom MMIC’s new GaAs MMIC Low Phase Noise Amplifier family offers previously unattained phase noise performance. Phase noise is a critical requirement which defines the performance level of most radars and communications systems. Custom MMIC added two new GaAs MMIC switches to its expanding product offerings: the SP3T CMD234C4 and SP5T CMD235C4, both covering DC to 18 GHz. Custom MMIC, a leading developer of performance driven monolithic microwave integrated circuits (MMICs), has added two new packaged driver amplifiers to their expanding product offerings, the CMD232C3 and the CMD231C3. Custom MMIC, a leading developer of performance driven monolithic microwave integrated circuits (MMICs) is celebrating its 10 year anniversary in 2016. Custom MMIC is proud to celebrate a decade of innovation, and its commitment to their clients, their products and the RF/microwave industry. Custom MMIC, a leading developer of performance driven monolithic microwave integrated circuits (MMICs), has the added CMD238 2 to 20 GHz amplifier to its market leading BroadRange Distributed Amplifier™ portfolio. Custom MMIC, a leading developer of performance driven monolithic microwave integrated circuits (MMICs), recently moved their offices to Chelmsford, Massachusetts. This move will support the company’s rapid growth, providing a threefold increase in office and lab space. Custom MMIC, a leading developer of performance driven monolithic microwave integrated circuits (MMIC), has added another new amplifier to its growing product line, the CMD233 2 to 20 GHz distributed low noise amplifier. driver amplifiers, attenuators, mixers, multipliers, phase shifters and switches. Custom MMIC, a leading developer of performance-driven monolithic microwave integrated circuits (MMICs), has expanded its standard product portfolio with three new frequency multipliers/doublers. The multiplier family now covers output frequencies from 8 to 40 GHz, with both passive and active architectures. The active multipliers offer high output power for driving mixers directly, while their passive counterparts offer low phase noise with a lower output power. Custom MMIC, a leading developer of performance driven monolithic microwave integrated circuits (MMICs), is pleased to announce the appointment of Aspen Electronics as their new technical representative covering the United Kingdom. Custom MMIC, a leading developer of performance driven monolithic microwave integrated circuits (MMICs), is pleased to announce the appointment of Seaport Technical Sales, Inc. as their new technical representative covering the Pacific Northwestern territory, including Idaho, Montana, Washington, Oregon and British Columbia. Custom MMIC, a leading developer of performance driven monolithic microwave integrated circuits (MMICs), is pleased to announce the appointment of MMS Technical Sales Inc. as their new technical representative covering the New England region. Charles J. Trantanella and Paul Blount, Custom MMIC, Westford, Mass. Custom MMIC, a developer of performance-driven monolithic microwave integrated circuits (MMICs), is pleased to announce the addition of the CMD219C4, a new GaN low-noise amplifier, to their standard product catalog. Custom MMIC, a developer of performance driven monolithic microwave integrated circuits (MMICs), is pleased to announce the appointment of Saguaro Technical Sales as their new representative in Arizona and New Mexico. Custom MMIC, a developer of performance-driven monolithic microwave integrated circuits (MMICs), is pleased to announce the addition of the CMD214, a new 24 to 36 GHz (output) active x2 frequency multiplier in die form, to its growing line of standard products. Custom MMIC, a developer of performance-driven monolithic microwave integrated circuits (MMICs), is pleased to announce the release of the CMD163, a 17 to 27 GHz low noise amplifier (LNA) in die form, to their growing line of standard GaAs amplifier products. Custom MMIC, a developer of performance driven monolithic microwave integrated circuits (MMICs), is pleased to announce the appointment of Cornes Technologies as their new technical sales representative in Japan. Custom MMIC, a developer of performance driven monolithic microwave integrated circuits (MMICs), is pleased to announce the appointment of TECH-INTER as their new European technical sales representative. Custom MMIC, a developer of performance-driven monolithic microwave integrated circuits (MMICs), announces the introduction of the CMD204C3, a DC to 20 GHz single-pole, single-throw (SPST) MMIC switch. Also available in die form (CMD204), the CMD204C3 is the latest control device added by Custom MMIC to its growing library of standard products. Custom MMIC, a developer of performance-driven monolithic microwave integrated circuits (MMICs), announces the introduction of the CMD203C4, a DC to 20 GHz single-pole, four-throw (SP4T), MMIC, switch housed in a leadless 4 x 4 mm ceramic package. The CMD203C4 is the latest control device added by Custom MMIC to its growing library of standard products. Custom MMIC, a developer of performance-driven monolithic microwave integrated circuits, is adding a new driver amplifier, the CMD192C5, to its growing product library. The CMD192C5 is the packaged version of the highly popular CMD192 amplifier that until now had only been available in die form. Custom MMIC is adding two new low noise amplifiers, the CMD167 and the CMD167P3, to their growing product line. Both are ideally suited for EW and communications systems where small die size and low power consumption are needed. Custom MMIC, a developer of performance-driven monolithic microwave integrated circuits (MMICs), announces the release of a new, easy-to-use Attenuator Calculator to its suite of free online tools. The company also offers Cascade Analysis, Thermal Analysis, and Image Rejection calculators. Custom MMIC, a developer of performance-driven monolithic microwave integrated circuits (MMICs), is pleased to introduce a new, easy-to-use Image Rejection Calculator to their suite of free online tools. Custom MMIC, a developer of performance-driven monolithic microwave integrated circuits (MMICs), is introducing a new 6-20 GHz Low-Noise Amplifier to its growing product library, the CMD194C3. The new packaged broadband amplifier offers low noise figure and high gain while requiring a single-supply voltage. Custom MMIC, a developer of performance-driven monolithic microwave integrated circuits (MMICs), is introducing a free, easy-to-use, Thermal Analysis tool to their array of web-based calculators. The company offers Attenuator, Image Rejection, Cascade Analysis, and now Thermal calculators. Custom MMIC, a developer of performance-driven monolithic microwave integrated circuits (MMICs), is introducing a new online, easy-to-use, cascade analysis calculator that lets you choose between input or output specifications for each component in your system. Custom MMIC, a developer of performance-driven monolithic microwave integrated circuits (MMICs), announces the addition of the CMD173P4 to their growing MMIC library of standard products. Custom MMIC announces the addition of the CMD190 to its growing MMIC library of standard products. The CMD190 is a highly efficient GaAs MMIC ultra low noise amplifier for applications from 33 to 45 GHz. Custom MMIC, (www.CustomMMIC.com), a developer of performance-driven monolithic microwave integrated circuits (MMICs), is pleased to announce the debut of several new GaAs MMIC amplifiers and mixers in booth #1807 at the International Microwave Symposium in Seattle, WA June 4-6th. Custom MMIC, (www.CustomMMIC.com), a developer of performance-driven monolithic microwave integrated circuits (MMICs), has added a new low noise amplifier, the CMD185P3, to its expanding line of standard amplifier products. Custom MMIC, a developer of performance-driven monolithic microwave integrated circuits (MMICs), has added four new amplifiers in die form to its product family: the CMD164, 165, and 173 distributed amplifiers, and the CMD166 driver amplifier. Custom MMIC, (www.CustomMMIC.com), a developer of performance-driven monolithic microwave integrated circuits, announces the introduction of the CMD172, a new voltage-variable attenuator (VVA) in die form operating from 18 to 40 GHz. Custom MMIC, (www.CustomMMIC.com), a developer of performance-driven monolithic microwave integrated circuits (MMICs), is now offering a new passive 6-10 GHz I/Q mixer, the CMD182C4. Custom MMIC, (www.CustomMMIC.com), a developer of performance-driven monolithic microwave integrated circuits (MMICs), is adding a new 5 to 11 GHz ultra-low noise amplifier to its growing line of high-quality products. The CMD132P3 presents an ultra-low noise figure of 1.3 dB, delivers greater than 20 dB of gain across the entire bandwidth, and has a corresponding output 1 dB compression point of +10 dBm. Custom MMIC added three new GaAs MMIC power amplifiers covering 5 to 11 GHz to their growing standard product library. The CMD169P4 (5 to 7 GHz), CMD170P4 (7.5 to 9 GHz) and CMD171P4 (9.5 to 11 GHz) each have an output 1 dB compression point of greater than +28 dBm, with gain levels from 20 to 30 dB. Custom MMIC, (www.CustomMMIC.com), a developer of performance-driven monolithic microwave integrated circuits (MMICs), has launched a new website which includes information related to its growing product library of commercially available amplifiers, mixers, control devices, multipliers, and multi-function MMICs. Custom MMIC has released a new amplifier into its growing MMIC design library of standard products. Custom MMIC (www.CustomMMIC.com), a developer of performance driven monolithic microwave integrated circuits (MMICs), announced the appointments of MHz Marketing, Southeastern Sales RF, and Allegiance Sales as their technical sales representatives. Custom MMIC, Chelmsford, Mass. and Custom MMIC, Chelmsford, Mass. Custom MMIC (www.CustomMMIC.com), a developer of performance driven monolithic microwave integrated circuits (MMICs), introduced three new devices from its growing MMIC IP/design library. CMD162 is a GaAs MMIC low-noise amplifier (LNA) chip for applications from 26 to 34 GHz. Optimized for 30 GHz satellite communications, the CMD162 boasts a typical noise figure of 1.7 dB with a small-signal gain of 22 dB and an output 1 dB compression point of +7 dB. The CMD283C3 broadband MMIC low noise amplifier is a 50 ohm matched design which eliminates the need for external DC blocks and RF port matching. We are excited to announce that our catalog of standardized GaAs and GaN designs has reached over 150 devices. Announcing the release of CMD292, an ultra-wideband 0.5 W GaAs distributed driver amplifier. CMD292 delivers 13 dB of gain with a corresponding output 1 dB compression point of +27 dBm. Our online, easy-to-use, cascade analysis calculator lets you choose between input or output specifications for each component in your system. The CMD291 is a wideband GaAs MMIC driver amplifier die which operates from 16 to 24 GHz. The broadband device is ideally suited for applications requiring high dynamic range. Announcing the release of CMD290, a wideband GaN LNA MMIC. CMD290 delivers 12.5 dB of gain with a corresponding noise figure of 2.3 dB and an output 1 dB compression point of +19 dBm at 13 GHz. Custom MMIC continues to rapidly add to its extensive family of MMIC Switches; with two new GaAs MMIC switches, the non-reflective CMD235C4 and CMD236C4. Custom MMIC discusses the importance of phased-array radar systems as well as the associated benefits and drawbacks and the new path forward. Custom MMIC announces three GaAs MMIC mixers for C-, X-, K- and Ka-Band applications. The CMD251C3 fundamental mixer, CMD252C4 I/Q mixer and CMD180 fundamental mixer deliver best-in-class isolation and conversion loss performance with low input power. These new MMIC mixers help increase dynamic range while reducing LO power and subsequent filtering. Custom MMIC announced an expanded collaboration with X-Microwave LLC, developers of a modular/drop-in simulation, prototyping and production system for solderless and reconfigurable RF/microwave circuits up to 67 GHz. The X-MWblockTM system enables efficient and expedient microwave and mmWave circuit development and testing, using industry grade non-linear online simulation tools. Custom MMIC has added two unique distributed amplifiers to their performance leading standard product line. The CMD242 distributed amplifier features ultra-wideband performance from DC to 40 GHz while delivering 10.5 dB of gain with a flatness of +/- 1 dB. The CMD244 distributed driver amplifier covers DC to 24 GHz, with a unique positive gain slope over frequency range. Custom MMIC added a new category to their rapidly expanding standard product offerings. Custom MMIC’s GaAs MMIC low phase noise amplifier family offers previously unattained phase noise performance. Phase noise is a critical requirement which defines the performance level of most radars and communications systems. The five product family achieves phase noise performance as low as -165 dBc/Hz at 10 kHz offset. Custom MMIC has added a distributed amplifier to its market leading portfolio of broadrange distributed amplifiers. The ultrawideband DC to 22 GHz performance of the CMD240P4 distributed amplifier is accompanied with a low noise figure of 2.2 dB and +28 dBm IP3. The performance levels of this device make it suited for an extremely wide range of applications, including electronic warfare, SIGINT, military radar and instrumentation. Custom MMIC recently developed a Tech Brief to help you simplify your biasing design approach, reduce your bill of materials, and reduce extraneous noise sources with Low Noise Amplifier MMICs (LNAs) that utilize only a positive bias. Download the tech brief, “Throw out complex bias sequencers along with the negative voltage supply” at www.custommmic.com. Custom MMIC is pleased to announce a GaAs MMIC frequency doubler, the CMD225C3. The released CMD225C3 operates with an input frequency range of 4 to 8 GHz. This passive frequency doubler can be driven with a +15 dBm input signal with a low conversion loss of 13 dB, and excellent Fo and 3 Fo isolations of at least 47 dBc. THe CMD225C3 is a 50 ohm matched design to eliminate the need for RF port matching. Custom MMIC has added two GaAs MMIC switches to its expanding product offerings, the non-reflective CMD234C4 and CMD235C4. The CMD234C4 is a DC-18 GHz broadband MMIC SP3T switch featuring a low insertion loss of 2.4 dB and a high isolation of 40 dB at 10 GHz. The CMD235C4 is a DC-18 GHz broadband MMIC SP5T switch offering broadband performance with an insertion loss of 2.5 dB and high port-to-port isolation of 40 dB at 10 GHz. Custom MMIC has added an amplifier to its Broadrange Distributed AmplifierTM portfolio, the CMD233C4. The 2 to 18 GHz distributed amplifier is a packaged version of the CMD233 die product. The CMD233C4 is a wideband GaAs MMIC distributed amplifier with a low noise figure of 4.5 dB and output 1 dB compression point of +20.5 dBm. This amplifier delivers over 9 dB of gain and operates from a single 3 to 6 volt supply. Custom MMIC has the added CMD238 2 to 20 GHz amplifier to its market leading BroadRange Distributed Amplifier™ portfolio. The CMD238 is a wideband GaAs MMIC distributed amplifier ideally designed for wideband applications requiring high linearity in a small die size. From 2 to 20 GHz, this amplifier delivers 14 dB of gain with an output P1dB of +26 dBm, an output IP3 of +34 dBm, and a 2nd harmonic level of -33 dBc. Custom MMIC has added an amplifier to its expanding product offerings, the CMD243 26 to 35 GHz low noise driver amplifier. The CMD243 is a wideband self-biasing GaAs MMIC balanced driver amplifier that offers 15.5 dB of gain with an output P1dB compression point of +21 dBm. The amplifier operates from a single 5 volt supply and draws just 90 mA typical. The balanced design provides good VSWR matching, along with improved stability and gain flatness. Custom MMIC has added two BroadRangeTM distributed amplifiers to their portfolio, the DC-22 GHz CMD240 and 2 to 22 GHz CMD241. Both products feature a unique positive gain slope, which eases the design of broadband systems by eliminating equalizer circuits or added amplifiers to compensate for the typical negative gain slope of most amplifiers. Both amplifiers are 50 ohm matched designs. Custom MMIC has developed a growing family of distributed amplifiers, called BroadRange Distributed Amplifiers™, with bandwidths from DC to 50 GHz. The distributed amplifiers provide industry leading performance in terms of dynamic range, frequency bandwidth and power consumption. The BroadRange Distributed Amplifier™ product line consists of over ten released products. The amplifiers are provided in low-profile die or QFN packaged. Custom MMIC is announcing the CMD232 2 to 9 GHz driver amplifier. The CMD232 is a wideband GaAs MMIC driver amplifier that offers high gain, wide bandwidth, single positive supply voltage, and a small die size. It is ideally suited for military, space, and communications systems that require small size and high linearity. At 6 GHz the device delivers greater than 15 dB of gain with a corresponding output 1 dB compression point of +17 dBm and an output IP3 of 23 dBm. The CMD231 is a wideband GaAs MMIC driver amplifier covering 2 to 6 GHz that offers high gain, single positive supply voltage, low current consumption, and small die size. It is ideally suited for communications systems needing small size and high linearity. The device operates from a +3 to +6 V supply. At 4 GHz, it delivers greater than 14.5 dB of gain with a corresponding output 1 dB compression point of +13.5 dBm and an output IP3 of 23.5 dBm. Custom MMIC has added another amplifier to its growing product line, the CMD233 2 to 20 GHz distributed low noise amplifier. The CMD233 is a GaAs MMIC distributed low noise amplifier that offers wide bandwidth, single positive supply voltage, low noise figure, and small die size. It is ideally suited for military, space, and communications systems that need a small size and low noise figure over a wide bandwidth. The device operates from a +3 to +6 V supply. Custom MMIC has expanded its standard product portfolio with three frequency multipliers/doublers. The Multiplier family now covers output frequencies from 8 to 40 GHz, with both passive and active architectures. The CMD213 active multiplier offers high output power for driving mixers directly, while the CMD226 and the CMD227 passive counterparts offer low phase noise with a lower output power. Custom MMIC, a leading developer of performance driven monolithic microwave integrated circuits (MMICs), has added a SPDT switch to their rapidly growing standard product portfolio - the CMD230.The CMD230 is a general-purpose, broadband, high-isolation reflective MMIC SPDT switch in die form. Covering DC to 26 GHz, it features low insertion loss of 1.4 dB, Input IP3 of 37 dBm and high isolation of 40 dB at 13 GHz. Custom MMIC is offering a low-noise amplifier that is perfect for EW and communication systems where small size and low power consumption are critical. The CMD223 features a low noise figure, high-gain, broadband performance, excellent return losses, and single positive supply voltage. At 13.5 GHz the CMD223 delivers greater than 22 dB of gain with a corresponding output 1 dB compression point of +13.5 dBm and a noise figure of 1.5 dB. Custom MMIC is pleased to announce the addition of the CMD219C4, a new GaN low-noise amplifier. The CMD219C4 is a broadband MMIC low-noise amplifier fabricated in GaN technology that operates from 4 to 8 GHz with a gain of 22.5 dB, a noise figure of 1.0 dB, and an output 1 dB compression point of +17 dBm. In terms of survivability, the CMD219C4 can withstand RF input power levels of up to 5 W without permanent damage. Custom MMIC, a developer of performance-driven monolithic microwave integrated circuits (MMICs), is pleased to announce the release of the CMD219, a 4 to 8 GHz low noise amplifier (LNA) in die form, to their growing line of standard GaN amplifier products. The CMD219 has a gain of 23 dB, an output 1 dB compression point of +18 dBm, and a noise figure of 1.1 dB across its operating bandwidth. Custom MMIC, a developer of performance-driven monolithic microwave integrated circuits (MMICs), is pleased to announce the release of the CMD218, a 5 to 9 GHz low noise amplifier (LNA) in die form. The CMD218 offers a gain of 22 dB, output of 1 dB, compression point of +19.5 dBm, and noise figure of less than 1.25 dB across the 5 to 9 GHz frequency range. Custom MMIC is pleased to announce the release of the CMD196, a DC to 28 GHz, non-reflective, SPDT switch in die form to their growing line of control products. Covering DC to 28 GHz, the CMD196 features low insertion loss of 1.75 dB, high isolation of 46 dB, and port return losses better than -15 dB at 14 GHz. Custom MMIC announces the addition of the CMD195, a new DC-20 GHz non-reflective SPDT switch, to their growing line of control products. The CMD195 operates across the DC to 20 GHz bandwidth with an insertion loss of 2.5 dB that reduces to 2 dB as the frequency increases. The terminated switch has an isolation of greater than 40 dB and port return losses less than -15 dB. Custom MMIC is pleased to announce the addition of the CMD158C4, a new 6 to 16 GHz driver amplifier, to their growing standard product line. The CMD158C4 delivers 21 dB of gain across its bandwidth, while providing +21 dBm of saturated output power at a PAE of 24%. The CM158C4 operates from a single positive supply voltage of +5.0 V at 95 mA. Custom MMIC announces the CMD207, a new 20 to 40 GHz MMIC driver amplifier in die form with an all positive bias scheme, to their growing list of standard products. The CMD207 delivers 25 to 30 dB of gain, has an output 1 dB compression point of +18.5 dBm, a saturated output power of +21 dBm, and a noise figure of 5 to 6 dB across the entire 20 to 40 GHz bandwidth. Custom MMIC is pleased to announce the release of the CMD179, a fundamental mixer in die form. The CMD179 is a general purpose, double-balanced GaAs mixer that can be used for up- and down-converting applications between 16 and 26 GHz. The mixer, offers conversion loss of 7 dB, an LO to RF isolation of greater than 40 dB, an IF bandwidth of 8 GHz, and an input IP3 of +18 dBm. 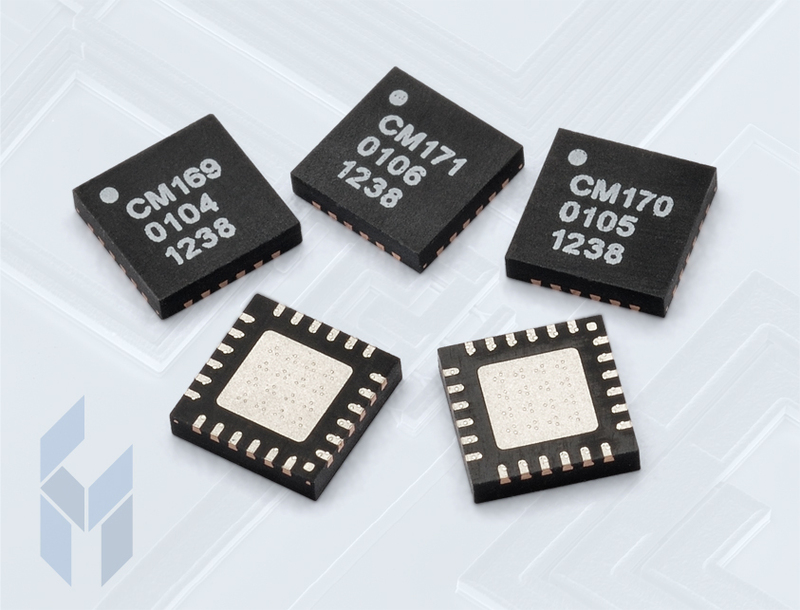 Custom MMIC, a developer of performance-driven monolithic microwave integrated circuits (MMICs), is introducing two DC-18 GHz SPDT non-reflective switches, the CMD195C3 and the CMD196C3. While both switches cover the same bandwidth and are housed in the same 3 x 3 mm RoHS-compliant SMT package, they differ in their insertion loss. Custom MMIC has added two new low noise amplifiers, the CMD167 and the CMD167P3, to their growing product line. The CMD167 is a highly efficient, ultra low noise GaAs MMIC amplifier that operates from 10 to 17 GHz. The CMD167P3 is the packaged version of the amplifier which operates from 8 to 16 GHz. Custom MMIC developer of performance-driven monolithic microwave integrated circuits (MMICs), announces the addition of the CMD191C4 to their growing MMIC library of standard products. The CMD191C4 is a GaAs MMIC driver amplifier housed in a leadless, RoHs compliant, 4 x 4 mm surface mount package. It offers high output power and low current consumption. Custom MMIC, a developer of performance-driven monolithic microwave integrated circuits (MMICs), announces the addition of the CMD192 to their growing MMIC library of standard products. The CMD192 is a wideband DC-20 GHz GaAs MMIC distributed amplifier available in die form. This amplifier delivers greater than 20 dB of gain with a corresponding output 1 dB compression point of + 22 dBm and a noise figure of 2.8 dB at 18 GHz. Custom MMIC, a developer of performance-driven monolithic microwave integrated circuits (MMICs), is offering a device from their growing MMIC library of standard products. The CMD187 is a wideband GaAs MMIC amplifier die for applications from 2 to 20 GHz. This device delivers greater than 22 dB of flat gain with a corresponding output 1 dB compression point of +14 dBm, and a noise figure of 4.5 dB at 20 GHz. Custom MMIC, a developer of performance-driven monolithic microwave integrated circuits (MMICs), is adding a 6 to 11 GHz low noise amplifier to their growing line of high quality products. The CMD186P3 presents an ultra-low noise figure of 2.1 dB, delivers greater than 18 dB of gain, and has a corresponding output 1 dB compression point of +16.5 dBm. Custom MMIC, a developer of performance-driven monolithic microwave integrated circuits, has announced a general purpose, double balanced fundamental mixer—the CMD178C3. This new mixer can be used for up and down converting applications between 11 and 21 GHz. Custom MMIC announces the introduction of the CMD158P3, a new broadband driver amplifier ideally suited for mixer LO chains, passive multipliers, and medium power applications. The CMD158P3 covers 6 to 14 GHz and delivers 20 dB of gain with +20 dBm of saturated power while requiring a single +5 V supply at 95 mA. Custom MMIC, a developer of performance-driven monolithic microwave integrated circuits (MMICs), is now offering a new passive 6 to 10 GHz I/Q mixer, the CMD182C4. This exciting new product is ideal for point-to-point, point-to-multipoint, and digital radios as well as VSAT terminals. Custom MMIC, a developer of performance-driven monolithic microwave integrated circuits (MMICs), is adding a new 5 to11 GHz ultra-low noise amplifier to their growing line of high-quality products. The CMD132P3 presents an ultra-low noise figure of 1.3 dB, delivers greater than 20 dB of gain across the entire bandwidth, and has a corresponding output 1 dB compression point of +10 dBm. Custom MMIC is offering a new device from their growing MMIC library of standard products. The CMD173 is a wideband GaAs MMIC distributed amplifier die for applications from DC to 20 GHz. This device delivers greater than 15 dB of gain with a corresponding output 1 dB compression point of +18 dBm, and a noise figure of 1.5 dB at 8 GHz. Custom MMIC, a developer of performance driven monolithic microwave integrated circuits (MMICs), is offering two new devices from its growing MMIC design library. The CMD157 (die) and CMD157P3 (packaged) are GaAs MMIC low-noise amplifiers (LNAs) for applications from 6 to 18 GHz. Custom MMIC is offering a new device from its growing MMIC design library. The CMD162 is a GaAs MMIC low-noise amplifier (LNA) chip for applications from 26 to 34 GHz. Optimized for 30 GHz satellite communications, the CMD162 boasts a typical noise figure of 1.7 dB with a small-signal gain of 22 dB and an output 1 dB compression point of +7 dB. This Tech Brief from Custom MMIC provides insights into the contributions to Phase Noise from common signal chain components, and discusses semiconductor typology issues related to key phase noise factors. Learn How Easy MMIC Biasing Can Be. In this Tech Brief, you’ll learn how to reduce your signal chain's bill of materials, simplify your bias circuitry, and reduce the number of extraneous noise sources with Low Noise Amplifier MMICs (LNAs) that utilize a positive bias. Custom MMIC has recently investigated the use of gallium nitride (GaN) to break through this linearity stalemate. Using GaN MMIC processes, Custom MMIC has achieved mixer IP3 levels of +40 dBm, with a very high linear efficiency of 10 to 15 dB.